This is the scrim that I was in a mad rush to finish before Christmas. This was a LOT of work but it turned out great! Well I think so anyway. ;-) I'm hoping to get word from the final recipient at some point. For reasons of privacy I can't really say much about the story behind this piece. I was given a photocopy of the crest to work from originally. I really didn't like how it looked, so I did a lot of research to find out just how closely I had to stick to what I was given, or could I make some changes. Found out that the important parts are the "parts" (the raven, the mountains, their size and location, etc) and the colors, but aside from that I could interpret it in my own way. So I did. 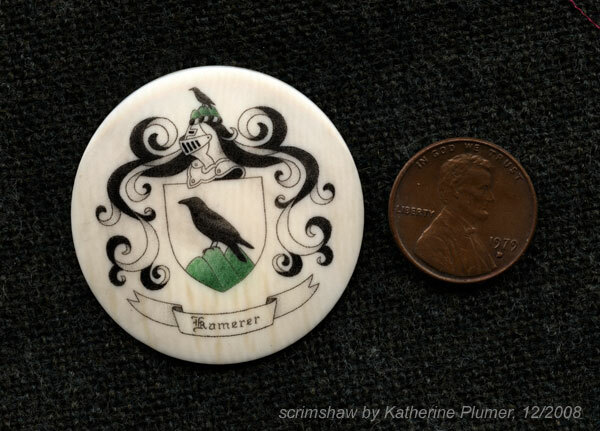 I changed the scroll work from a very clunky acanthus leaf to this more "pretty" ribbon scroll, and redrew the raven so it's actually properly proportioned (the original was a bit pigeon-ish).